It was five years ago that Laura Love sprang into public view with her debut disc on Putumayo Records  blending Celtic themes and African rhythms, it was one of the most complete and seamless examples of true "world beat" music. In the years since, the stew that is Laura Love's music has only added more ingredients. There are Hindi influences now, and Amerindian and a strong streak of country-western. The daughter of former Count Basie sideman Preston Love, Laura Love is equal parts composer, singer and arranger  and not a bad guitarist, either. 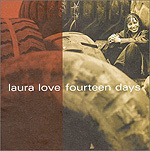 Her latest album, "Fourteen Days" (taken from a song included here about the Seattle WTO street demonstrations), contains some of her strongest songs yet, as well as an updated reading of Laura Nyro's "Stoned Soul Picnic." A self-described hippie, Love's music has an idealism and warmness that often seems to have disappeared from a lot of popular music over the past twenty years. It's a refreshing positiveness, especially when combined to such strong songs and musicianship.